Santa Barbara, CA - The Atkinson Gallery at Santa Barbara City College is delighted to announce the April 10th opening of "corrosion/erosion" - the second Atkinson Gallery Annex exhibition of the year. Curated by Atkinson Gallery Intern, Emilia Dattilo, "corrosion/erosion" features eight SBCC student artists whose diverse conceptual interpretations of the theme are executed with different styles and techniques. The show highlights the weathering, wearing away or deterioration of physical substances, both of natural and synthetic origin. Each artist's own observation, reflection, curiosity and research have all evidently been sources of inspiration for their work. From the deconstruction of houses and other images which display society's developments, to the abstracted representations of the gradual abrasions of materials, this exhibit captures the very essence of corrosion and erosion. Featuring paintings, drawings, collage, prints and sculpture, this exhibition is a vibrant representation of the works being created in our very own art classes and programs at SBCC. 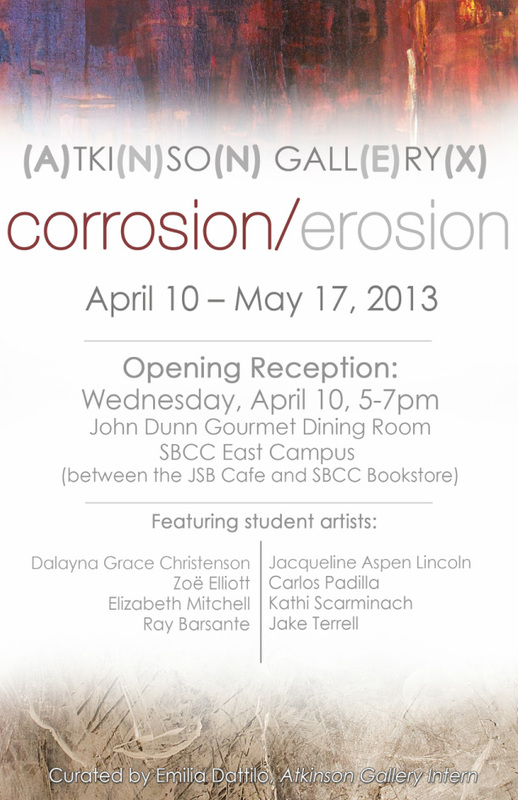 "corrosion/erosion" features artists Ray Barsante, Dalayna Grace Christenson, Zoe Elliot, Jake Terrell, Carlos Padilla, Elizabeth Mitchell, Kathi Scarminach and Jacqueline Aspen Lincoln, and will be on display from April 10th through May 17th in the John Dunn Gourmet Dining Room on Santa Barbara City College's East Campus (in between the JSB Cafe and SBCC Bookstore). The Atkinson Gallery is very excited to be partnering with the Culinary Arts Program to continue the Annex's student curated student exhibition program. Culinary Arts is generously providing this space and refreshments for the Annex exhibitions while the Humanities building is under construction. The exhibition will be available for viewing during the Gourmet Dining Room's regular hours: Monday - Friday, 11:30am - 12:45pm and Thursday - Friday, 5:30pm - 6:30pm.